Summary: India is not opposed to infrastructure development in the region, but it is concerned about the strategic implications of certain Chinese-led initiatives. Japan and the United States have been among the primary donors for development projects in Asia since World War II, although other countries such as Germany and the United Kingdom (UK) have played a greater role in recent years as well.2Japan in particular has provided significant development assistance to South Asian countries, including India. Meanwhile, China’s emergence as a regional strategic and economic actor has reshaped the prospects for connectivity in Asia. Beijing has demonstrated a newfound sense of political will to undertake regional connectivity initiatives, supported by the country’s surplus capital, a shift that has changed the security environment in India’s neighborhood. Beijing’s growing collaboration with India’s neighbors has created a sense of unease in New Delhi. Like any rising power with global ambitions, China is looking to expand its presence and increase its profile beyond its immediate neighborhood. Naturally, as China’s influence in South Asia grows, India is faced with the challenge of managing its relationship with its biggest neighbor and competing to maintain its prominence in the region. India has begun to view China’s commercial initiatives as a means to advance its strategic ambitions in ways that often are not conducive to India’s interests. Former Indian foreign secretary Subrahmanyam Jaishankar noted in 2016 that the “interactive dynamic between strategic interests and connectivity initiatives – a universal proposition – is on particular display in our continent.”3 He went on to caution against countries using connectivity “as an exercise in hard-wiring that influences choices.”4 The view that connectivity offers a set of tools to influence other countries’ foreign policy choices has become commonplace in analysis about the China-led Belt and Road Initiative (BRI). The BRI has garnered much attention, positive and negative, since its inception in 2013. It is one of the world’s biggest initiatives for promoting connectivity and providing funds to finance infrastructure development. In South Asia, the BRI underscores the growing Sino-Indian competition in the subcontinent and the Indian Ocean region. India has started to craft a policy response. In its strongest stance on the BRI to date, India marked its protest by not attending the Belt and Road Forum that China hosted in May 2017. In official statements, India questioned the initiative’s transparency and processes, and New Delhi opposed the China-Pakistan Economic Corridor (CPEC) due to concerns about territorial sovereignty. As India calibrates its policy response, instead of perceiving the BRI as one project, it would be wise to look at the initiative as a culmination of various bilateral initiatives, many of them involving projects that were actually initiated before the BRI itself was formally launched. The Bangladesh-China-India-Myanmar (BCIM) Economic Corridor, for instance, was launched in the early 1990s. Similarly, China’s Twenty-First Century Maritime Silk Road (MSR) is a combination of bilateral infrastructure projects in the Indian Ocean region that China has sought to present as a multilateral initiative. India will have to work with its partners in the region to offer alternative connectivity arrangements to its neighbors. To date, New Delhi has been slow in identifying, initiating, and implementing a coherent approach to connectivity in the region. Although India has identified countries such as Japan as key partners in formulating a response, there has been little progress on a plan of action. New Delhi urgently needs a structured framework for providing an alternative to Chinese-led connectivity initiatives to protect its strategic goals and remain a dominant power in South Asia and the Indian Ocean region. Beijing’s connectivity drive predates the BRI. It began at home in the early 2000s, as China focused on developing its western regions. As China’s coastal regions flourished in the 1990s, the economic development gap between these areas and the interior and western parts of the country increased. Infrastructure investments, primarily in transportation, were one of the driving factors of the resulting Great Western Development Strategy.6Soon after, Beijing began to look at connectivity and infrastructure projects beyond its borders to connect China to its neighbors in Asia, through Central Asia up to Europe, over land, and through the sea. Railway, road, and port development have primarily been at the forefront of Beijing’s connectivity drive in the region and beyond. The BRI weaves together all these preexisting initiatives into one grand plan, while the conversations on the projects with participating nations remain mostly bilateral. The BRI was first formally announced as One Belt One Road by Chinese President Xi Jinping in 2013. Xi talked about the Silk Road Economic Belt during a visit to Kazakhstan in September 2013. A month later in October 2013, Xi proposed the MSR while speaking at the Indonesian parliament. China’s proposal to revive the Silk Road is an ambitious idea based on multilateral cooperation. The initiative has two components. First, there is a continental road (or the economic belt) connecting China to Europe through South and Central Asia. Second, the MSR aims to create a sea corridor between China and Europe by way of the Indian Ocean. Regarding the continental route, India’s primary concern is the CPEC and increasing unease about Chinese connectivity investments in Nepal. The MSR is a broader issue for New Delhi, as the Indian Ocean is a primary area of interest for the Indian Navy and is directly linked to the country’s maritime security and strategic interests. While there has been uncertainty regarding the success of the BRI, there has been little doubt about the economic benefits of such a network for the region writ large.7 For several Asian countries, China’s capital has been a welcome addition for addressing the region’s massive infrastructure requirements. By offering projects aimed at infrastructure development, Beijing has begun to assume a leadership role. China is well placed to use its economic growth to address the regional challenges related to growth and development. With a lack of alternatives, China’s proposals seem lucrative to smaller nations in need of better infrastructure and connectivity. China is well placed to use its economic growth to address the regional challenges related to growth and development. For China domestically, the BRI was aimed at generating jobs and placing China at the same table of development donors as the United States and Japan. This also helped Beijing present itself as a provider of public goods, setting itself apart as a leader. In his annual report before the National People’s Congress, Chinese Premier Li Keqiang in 2015 underlined Beijing’s ambitions to “go global” by involving Chinese firms in overseas infrastructure building projects and partnering with foreign firms.8 In 2013, China’s focus revolved around appeasing its neighbors and emphasizing peaceful development. By 2015, Beijing was aggressively pursuing a new role in the global order. In South Asia, the increasing degree of competition between China and India has raised the stakes. Until China’s BRI emerged, New Delhi did not sense a threat to its bilateral relationships with its neighbors, as India’s relationships with other leading infrastructure funders in South Asia, such as Japan, are not characterized by such a prevailing sense of competition. China’s rise highlights India’s underlying wariness that Beijing’s influence in the region comes at the expense of New Delhi’s standing as a regional leader. China’s diplomatic outreach in South Asia seems to be a result of its global ambitions to be a great power. Like the typical rising power, China questions the existing order and aims to create a structure more favorable to its interests. Such a shift, if advantageous to China, would profoundly affect New Delhi’s strategic and national interests. China eventually released official documents to elaborate on its vision for the BRI, although detailed plans did not quickly emerge. Nearly two years after Xi’s initial announcement of the Silk Road, the Chinese government in March 2015 released a Vision and Action document titled “Jointly Building Silk Road Economic Belt and 21st-Century Maritime Silk Road.”9 The document reemphasized the need to build on traditional trade, infrastructure, and cultural links and the opportunities for regional cooperation. It underlined the changing geopolitical landscape and put forward China’s principles on win-win cooperation. On connectivity and infrastructure, it put forward four priorities: transport infrastructure, port infrastructure, aviation infrastructure, and energy infrastructure. The document also mentioned the need for an Information Silk Road through the construction of “cross-border optical cables,” “transcontinental submarine optical cable projects,” and “spatial (satellite) information passageways.”10 Yet the document failed to address issues such as a project selection process, the nature of consultation, and terms of negotiations in a structured way. It is likely that China did not have a detailed plan for the BRI either during its launch in 2013 or in the following years.11 Beijing began to construct a road map based on the reactions from the global community. As China began to discuss the project in bilateral settings, the lack of a detailed plan and framework raised considerable doubt and suspicion around the world. Despite these misgivings, China has continued to use the BRI to signal its willingness to increase its regional influence and play a larger leadership role. Even as Xi unveiled the BRI, the 2013 U.S. government shutdown in Washington, during which then president Barack Obama canceled a tour of Asia, cast doubts on the U.S. pivot to Asia.14 Beijing used this opportunity to fill that vacuum and present itself as a new Asian leader. It was around mid-2014 that President Xi Jinping began pushing the mantra of “Asia for Asians.” China began invoking a sense of regionalism and creating a space for itself to lead by presenting new solutions to regional issues. Xi Jinping in 2014 noted, “In the final analysis, it is for the people of Asia to run the affairs of Asia, solve the problems of Asia and uphold the security of Asia. . . . As China is a strong champion of the Asia security concept, it also works to put such a security concept into practice.”15 The message was clear: Asian countries should not rely on external actors for their growth and development, but take matters into their own hands and shape their own destiny. The underlying message was clearer: China is willing and ready to lead the region. Following the launch of the BRI in 2013, China continued to discuss the Belt and Road in all its bilateral engagements, aiming to garner positive statements in support of the initiative. International support was an easy way for China to lend credibility to the initiative and dispel concerns and hesitations. However, the stronger China pushed to secure international support for the initiative, the louder were concerns on the initiative’s lack of transparency and details.16 Although Beijing was recounting international support at every forum, it was not until 2017 that China began to sign agreements and understandings exclusively on the Belt and Road (see table 1 for a list of Chinese agreements with a direct reference to the Belt and Road). Most of China’s infrastructure projects—the corridors and ports—began as bilateral projects much before the BRI was officially rolled out. The Belt and Road bundles together all of China’s ongoing projects into one package and presents it as a multilateral initiative. It also identified a few new projects. The CPEC was the first agreement exclusive to the Belt and Road Initiative. Many proposed corridor and port projects have yet to be confirmed or discussed, such as the Kolkata port. Some ports, such as Gwadar, are not mapped on Beijing’s MSR, yet Gwadar is clearly a part of the CPEC. This lack of consistency and fine details about the process and mechanisms of the initiative have raised a number of questions. Growing concerns led China to host the first international forum on the BRI in 2017. The primary factor in China’s emergence as a key player in infrastructure development has been its capital surplus. None of the existing (United States and Japan) or emerging (India) powers can challenge Beijing’s advantages in connectivity financing. Some estimates project that China will invest up to $4 trillion to realize its vision for the BRI.20 Even combined, Japan and its partners cannot rival China on connectivity financing. Beyond capital, there are also serious challenges in coordinating projects in third countries. While China has complete control over its identification of projects and investments abroad, partnering countries would have to identify projects and implementation through their respective priorities and consultative mechanisms usually delaying the implementation process. China is increasing its efforts by committing further capital through the Silk Route Fund, China Development Bank, and the Export-Import Bank, among others. 21While China enjoys unparalleled advantages in terms of its surplus capital, its efforts may encounter challenges in terms of project implementation, inconsistent use of international best practices, and high interest rates and debt burdens. The trust deficit and the lack of transparency in BRI is perhaps why Beijing was unable to mobilize unified support for its initiative at the forum. Despite the presence of an impressive list of nations, including Japan, the dominant investor in infrastructure projects in Asia, China was unable to issue a joint communique signed by all nations present. Instead, the communique was signed by thirty nations including Myanmar, Pakistan, and Sri Lanka from India’s neighborhood.22 According to Chinese analysis, “It shows that Russia, Kazakhstan, Thailand, Pakistan and Indonesia are the five most cooperative countries in advancing the BRI.”23 Although nations such as the United States, UK, France, Germany, Australia, and Japan attended, they abstained from committing to the joint statement, which suggests that they, too, have concerns about the BRI and China’s intentions. Some of India’s neighbors were among the countries that thronged the forum. Not only did China gain Nepal’s support just a day before the forum, but it also signed fresh agreements with six of India’s neighbors: Pakistan, Sri Lanka, Bangladesh, Nepal, Myanmar, and Afghanistan. The leadership from Pakistan, Sri Lanka, and Nepal made speeches congratulating President Xi Jinping for his regional leadership and welcomed Chinese investments in their respective countries. The fact that China was able to garner such an impressive response from India’s neighbors without New Delhi’s participation signifies a number of things. One, it exposes India’s inability to offer substantial development assistance to its smaller neighbors. Two, it highlights that the smaller countries welcome the presence of another rising power and are willing to accommodate the competition that follows such a change in power dynamics. Three, this development underlines India’s lack of strategic engagement with its neighborhood, although Prime Minister Narendra Modi’s Neighborhood First policy is a step toward correcting this neglect. India only began to debate the implications of the BRI when China deepened its infrastructure engagements with India’s neighbors in South Asia and the Indian Ocean region. As New Delhi continued to debate its political calculations on the Belt and Road, there were significant voices on both sides of the political dilemma surrounding whether India should participate in the Belt and Road and the initiative’s May 2017 forum. On the one hand, some proponents of Indian participation pointed to specific ways that India could benefit from the BRI. The most obvious example is that the BRI would provide a way to help finance the country’s domestic infrastructure projects. The economic benefits India could accrue might be especially pronounced in the northeastern part of the country, which has traditionally been geographically distant from the rest of India and from major cross-border trading routes. To those sympathetic to Indian participation in the BRI, the sense that connectivity is gaining momentum throughout the Indo-Pacific further underscores that New Delhi should consider ways to enhance its own economic standing on trade and transportation issues so as to avoid being left behind. Yet despite these potential benefits, Indian opposition to the BRI appears to have ultimately won out. India’s misgivings about Chinese-funded projects through the BRI ultimately come down to a few key concerns. New Delhi is worried that Chinese-funded infrastructure projects may: 1) run afoul of accepted international standards and norms; 2) undermine Indian sovereignty claims on disputed border territories and other security interests, especially vis-a-vis China and Pakistan; and 3) grant China greater geopolitical influence and undue economic and diplomatic leverage over the policymaking decisions of India’s neighbors in ways that disadvantage India. Indian opposition to the BRI appears to have ultimately won out. India is increasingly concerned about China using regional connectivity projects to alter the narratives surrounding disputed territories in its favor. The Indian government’s May 2017 statement claims that China has exhibited a disregard for territorial integrity, particularly with respect to the CPEC, which runs through the disputed territory of Kashmir. According to India, this is a violation of its sovereignty, and participating in the BRI would undermine New Delhi’s position on the dispute, as Beijing supports Islamabad’s view of the dispute. The CPEC and certain other aspects of the BRI more broadly tend to disregard India’s concerns about sovereignty and territorial integrity. On India’s eastern border, China claims Arunachal Pradesh in its entirety and Ladakh in the north, states under Indian jurisdiction. The 1962 Sino-Indian War was fought over Arunachal and Ladakh, a fact that makes many Indians more suspicious of Beijing’s motives for building infrastructure projects in border regions and in disputed areas. Moreover, India is very wary of China’s efforts to build projects in countries neighboring India (such as Bangladesh, Myanmar, Sri Lanka, and Pakistan), projects that might afford Beijing an added strategic advantage in its rivalry with India. Given the border tensions between India and China, Beijing must demonstrate respect for territorial integrity for India to view the BRI in a positive light. India’s often reactionary approach to Beijing’s connectivity projects in the region has lacked coherence at times. India often has found itself caught up in responding to the latest developments, while China is moving steadfastly toward establishing itself as a key player in South Asia and the Indian Ocean region. An examination of the following four corridors helps illuminate what activities China is engaged in, what opportunities and concerns these activities present for India, and how India might respond. The CPEC begins at Kashgar in China’s Xinjiang Uighur Autonomous Region and ends at the port of Gwadar in Pakistan’s Balochistan Province. The initiative’s architects envision building a network of highways, roads, railways, pipelines, ports, and information technology parks along the route. Two focal points of the corridor are the development of Gwadar to enable the movement of Chinese goods from China’s western provinces to the Arabian Sea by way of the Indian Ocean, and the modernization of the Karakoram Highway between Pakistan’s Punjab Province and Gilgit-Baltistan. The corridor aims to connect Gilgit in northern Pakistan to Gwadar in the south.31 Chinese entities have invested approximately $62 billion in the CPEC.32 China’s grand ambitions for infrastructure investment in Pakistan are unmatched by any of Islamabad’s other strategic partners. New Delhi’s primary opposition to the BRI has focused on the economic corridor linking China and Pakistan. India has three main concerns—territorial sovereignty, security, and the deepening China-Pakistan strategic partnership. These issues come together quite starkly in Jammu and Kashmir, where the borders of China, India, and Pakistan meet. New Delhi’s concerns have made it difficult to imagine that it would link its own regional infrastructure initiatives with the CPEC. India opposes the CPEC due to concerns about sovereignty, and unless India and Pakistan come to an understanding on the issue, there is little hope for positive movement on this front or for constructive dialogue about connectivity collaboration with Beijing. China’s apparent disregard for territorial sovereignty in India’s neighborhood will be the leading challenge to further Sino-Indian cooperation on connectivity and infrastructure development. This long-standing concern goes back to the 1970s, when India objected to the construction of the Karakoram Highway through Pakistan-occupied Kashmir. China’s recent initiatives, including the CPEC, have led New Delhi to restate those concerns. There is a widespread misperception that the territorial dispute involving Jammu and Kashmir features only two parties (India and Pakistan). In fact, China has been an important third party to the dispute. As then Indian defense minister A. K. Antony noted in 2012, “Indian territory under occupation by China in Jammu & Kashmir since 1962 is approximately 38,000 [square kilometers]. In addition to this, under the so-called China-Pakistan ‘Boundary Agreement’ of 1963, Pakistan illegally ceded 5,180 [square kilometers] of Indian territory in [Pakistan-occupied Kashmir] to China.”33 Speaking at the seventieth session of the UN General Assembly in 2015, the Indian representative noted, “India’s reservations about the proposed China-Pakistan Economic Corridor stem from the fact that it passes through Indian territory illegally occupied by Pakistan for many years.”34 India is watching developments involving the CPEC very closely and has conveyed its concerns to China, asking Beijing to stop all activities in the area.35Allowing the CPEC to continue would undermine India’s sovereignty and bolster Pakistan’s claim to the disputed territory. One of India’s main concerns about the CPEC is a sustained Chinese military presence in Pakistan-occupied Kashmir. One of India’s main concerns about the CPEC is a sustained Chinese military presence in Pakistan-occupied Kashmir, which would have serious security implications for India. Beijing and New Delhi went to war in 1962 over a border dispute along the Himalayas in northern and eastern India. If China were to have a more permanent military presence by way of Pakistan on India’s northwestern border, that would affect New Delhi’s defense and security priorities. India already has regular border skirmishes with Chinese troops along its eastern border in Arunachal Pradesh. Moreover, the 2017 standoff between Indian and Chinese troops on the Doklam plateau along the Himalayan border severely strained Sino-Indian relations.36 There are already reports of a Chinese military presence on the Pakistan front of the Line of Control (LoC) in Kashmir. China will reportedly place 30,000 army personnel to protect its economic interests in occupied Kashmir.37 Any further increase in Chinese troops along India’s borders would be a serious and immediate threat to India’s security. While Kashmir’s emergence as a land bridge between China and Pakistan sharpens the traditional geopolitical divide between New Delhi and Beijing, Gwadar helps lend the BRI a maritime dimension. India views the Pakistani port as part of China’s unfolding maritime power projection into the Indian Ocean. Although Gwadar is currently a civilian facility, many in New Delhi expect that it will emerge as an important naval base for China. If this turns out to be the case, Chinese access to Gwadar’s port would allow the Chinese navy to sustain a presence in the Indian Ocean, altering the region’s power dynamics. Without ports and access to military facilities, China would have serious challenges in this body of water where the Indian navy has historically enjoyed a dominant role. In the end, given New Delhi’s concerns about territorial sovereignty in Kashmir and growing mistrust between India and China, there is little hope for Sino-Indian cooperation along this corridor. The BCIM Economic Corridor is a Chinese proposal that predates Xi’s BRI. It seeks to build on the historic links between the eastern Indian subcontinent and southwestern China through Bangladesh and Myanmar along what was known as the Southern Silk Road.39 The corridor aims to connect the Chinese city of Kunming with the Indian city of Kolkata through Dhaka in Bangladesh and Mandalay in Myanmar, seeking to boost trade, build infrastructure, and foster connectivity among these nations. Originally called the Kunming Initiative, it has been under discussion since the 1990s and seeks to expand tourism, transportation, and trade routes between the countries involved. China sent a substantial delegation to a related conference in 1999, injecting a new sense of enthusiasm into multilateral cooperation in South Asia, a region where Chinese influence historically has been weak compared to India’s. The initiative gained greater government traction when it was rechristened the BCIM Economic Corridor, also in 1999. The corridor has evolved over time from a public discussion to a track II initiative, and today it functions as a track 1.5 engagement. Unlike the CPEC, the BCIM Corridor has encouraged engagement between New Delhi and Beijing, emerging as a pillar of concrete cooperation in an otherwise rocky Sino-Indian relationship. At the end of a 2013 visit to India by Chinese Premier Li Keqiang, the joint statement noted the progress made in “promoting cooperation under the BCIM . . . Regional Forum” and that “the two sides agreed to consult the other parties with a view to establishing a Joint Study Group on strengthening connectivity in the BCIM region.”40In 2015, Modi and Xi similarly “welcomed the progress made in promoting cooperation under the framework of the BCIM . . . and [they] agreed to continue their respective efforts to implement understandings.”41 India and China have consistently expressed diplomatic support for the BCIM Corridor, keeping in mind the need for dialogue in the Sino-Indian relationship. However, despite this positive rhetoric, much of this enthusiasm is largely symbolic; effective cooperation through the BCIM Corridor has been seriously limited. While New Delhi sees the sense of promoting regional connectivity, it has serious strategic concerns about working with China on its eastern border. There is a widespread sense that India is playing for time as it debates the costs and benefits of working with China in the eastern subcontinent. While New Delhi sees the sense of promoting regional connectivity, it has serious strategic concerns about working with China on its eastern border. Although India—being a founding member—continues its discussions on the BCIM Corridor, New Delhi is unlikely to take an active approach to this corridor due to its various security concerns. Even though India sees little benefit to and little room for collaborating with China in this corridor currently, New Delhi is unlikely to pull out of this grouping altogether. could be perceived as hostile and would further deepen the strategic mistrust between the two countries. In short, India views China as a competitor and expects that the BCIM Corridor, given the current geopolitical environment, risks advancing Chinese expansion in the subcontinent. New Delhi considers this area to be in its traditional sphere of influence. Long-accumulated distrust of China has prevented India from exploring the possibilities for overland economic cooperation with China. Greater transparency by Beijing might allow New Delhi to lessen its distrust and begin cooperation on small trans-border projects. India, for its part, must consider prospects for collaboration on specific pockets of the corridor, such as projects in Myanmar and Bangladesh to promote regional connectivity and boost infrastructure development. Aside from the corridor itself, India is also keen to rejuvenate and collaborate to enhance regional linkages under the Bay of Bengal Initiative for Multi-Sectoral Technical and Economic Cooperation (BIMSTEC); in addition to India, this framework includes neighboring countries like Bangladesh, Bhutan, Myanmar, Nepal, Sri Lanka, and Thailand but does not include China. Connectivity cooperation can become one of the core pillars of cooperation among the BIMSTEC members. The Himalayan Economic Corridor was initially a bilateral proposal between Nepal and China. It now marks the latest addition to the BRI. While Nepal formally joined the Belt and Road in May 2017, the country has held multiple bilateral discussions with China on creating a corridor across the Himalayan Mountains. All bilateral projects along the Himalayas today form a part of the Himalayan Economic Corridor and by extension the BRI. China is aware of the geographic and political challenges to creating a corridor connecting Kathmandu and Beijing. The Himalayas are a natural geographic barrier, and New Delhi is unlikely to take Sino-Nepalese collaboration along its northern borders lightly. In 2014, Beijing doubled down on this thinking by proposing a broader Trans-Himalayan Economic Corridor, a trilateral project involving Nepal and India. This proposal was based on an idea floated by former Nepalese prime minister Pushpa Kamal Dahal in 2010 to foster “trilateral strategic relations” between the three countries across the Himalayas.44Beijing perhaps assumed that it would be easier to engage New Delhi on the matter if China were to include India in initial discussions.45As it stands, this trilateral arrangement remains at the proposal stage, as the Indian government has issued no formal response. While New Delhi offered no positive response to Beijing’s overtures, Kathmandu was enthusiastic about greater Chinese investments. Nepal is reliant on India for the movement of its goods and is keen to present itself as a transit hub for cross-Himalayan trade. In 2016, Dahal encouraged such collaboration, noting that the “Himalayas can no more be considered as barriers and obstacles. Instead, they can serve as important bridges that connect the two emerging regions of [the] Asian continent. Most importantly, connectivity lies at the heart of trans-Himalayan cooperation.”46 The same year, Kathmandu and Beijing began discussing an extension of the Chinese rail link to Lhasa in Tibet and on to Kathmandu in Nepal. To further extend its already sizable connectivity ambitions, China began proposing a rail link to Nepal that would cut through the Himalayas. By seeking to establish the Trans-Himalayan Economic Corridor with Nepal parallel to the in-progress CPEC with Pakistan, Beijing is aiming to create an alternative to Kathmandu’s traditional reliance on Indian ports for trade and the movement of goods. India watched these rapid developments in its neighborhood closely. Since independence, India had chosen to keep its Himalayan borders inaccessible and poorly connected. While China aggressively sought to connect its borders, India neglected its own, creating massive disconnects between its borders and hinterlands, especially on its Himalayan front. By helping create multiple access points via roads and ports, China is able to present an alternative to South Asian nations and cultivating the means to challenge India’s role as a South Asian power. Seeking to cut across some of the world’s most difficult terrain and enhance connectivity with Bhutan and Nepal, this India-led rail link is as much strategic as commercial. Building up its border regions as opposed to keeping them disconnected will help India facilitate the movement of goods and troops from other parts of the country to this region. These initiatives constitute India’s response to past neglect of its border regions and China’s increasing commercial and military presence in contested areas.51 Yet implementation challenges remain primarily due to the tough Himalayan terrain on the Indian side compared to better conditions on the Tibetan Plateau. Sino-Indian competition in the Himalayas is likely to intensify, deepening the security dilemma between the two countries. New Delhi will have to continue to act and think rapidly when it comes to presenting alternatives to its landlocked neighbors, especially as China continues to knock on their doors with significant commercial benefits in hand. Sino-Indian competition in the Himalayas is likely to intensify, deepening the security dilemma between the two countries. Although India would benefit from tapping into Chinese investments to advance India’s own connectivity projects, the decreasing strategic trust between the two neighbors will very likely prevent any productive collaboration. The MSR is the vast sea-based component of the larger BRI. It began in 2013 with a focus on strengthening China’s maritime ties with its neighbors in the Association of Southeast Asian Nations (ASEAN). Beijing later gradually expanded the initiative to include other coastal countries with the aim of connecting China to potential economic partners in Europe, Africa, and the Indian Ocean. In addition to boosting regional connectivity, the initiative traces the historical and cultural linkages between China and other countries along the region’s ancient Silk Road–affiliated sea routes. The MSR encompasses a variety of infrastructure projects, including ports, highways, airports, roads, and bridges. New Delhi is concerned that China will establish a foothold in the Indian Ocean region and challenge India’s advantageous maritime position there. India’s official stance on the BRI is that there is not enough available information about the initiative to make an informed decision, but in practice India already has taken several steps by itself and in concert with other partners to bolster its own regional influence apart from the BRI. China’s intensified presence in the Indian Ocean (as evidenced by increased submarine forays and other signs) is a reality, and New Delhi is finally beginning to respond to the changing security environment. In effect, India is wary that the MSR could threaten its role as a prominent power in the Indian Ocean. Where possible, the Indian and Chinese governments increasingly recognize that they must find a way to limit the potential for conflict in the maritime domain. One method for doing so is the India-China maritime security dialogue, which is aimed at establishing a regular channel for communicating about challenges and concerns. India and China are engaging with each other multilaterally too, through platforms such as the BRICS (a group of countries consisting of Brazil, China, India, Russia, and South Africa) and the Shanghai Cooperation Organization. While these and other efforts to mitigate the security dilemma between Beijing and New Delhi are under way, tensions remain. At the same time, to protect its own interests, India already has begun taking some steps largely on its own. For example, India is modernizing and expanding its own maritime infrastructure and creating institutional capabilities to undertake infrastructure projects in the Indian Ocean and countries that border it. Notably, the Modi government has intensified efforts to develop the port of Chabahar in Iran, widely seen as an attempt to counter China’s presence in Gwadar and along the MSR more broadly. India has also launched Project Mausam, a cultural initiative to develop a narrative about India’s historical links with the Indian Ocean littoral. Many observers see this as an attempt to offset China’s Silk Road claims. This dynamic is very evident in New Delhi’s relationships with small island states in the region. India has long been an important security provider and strategic partner to island nations like the Maldives, Mauritius, the Seychelles, and Sri Lanka. Although these islands are small, they lie in crucial sea lines of communication that offer a significant basis for projecting power and securing and protecting key trading routes. These islands could afford any nation with influence over them the opportunity to monitor waterways and project power during times of peace and the ability to indict adversaries during conflicts. India has long engaged in initiating capacity-building programs for island states to secure their maritime surroundings. Most of these island nations lack the capacity to protect and monitor the waters in their large exclusive economic zones (EEZs), an area extending up to 200 nautical miles from a country’s sea baseline. Upon request, India deploys its naval assets to help monitor the EEZs of countries like Mauritius and the Seychelles. In addition, India is helping island states monitor and address nontraditional security threats, such as drug trafficking, by building a radar network with a range that extends from Sri Lanka to Mauritius. The steps that India is taking have a direct bearing on Beijing’s suspected maritime ambitions in the region. Given that the bulk of global trading is seaborne, the ability to protect energy supply lines is extremely crucial for a rising power like China. For Beijing to become a global power, it will have to establish itself as a key player in the Indian Ocean region in terms of protecting its supply lines and securing international waters. Yet it will be difficult for China to maintain the naval presence required to achieve these objectives without access to ports and bases for its military assets in the Indian Ocean. India’s chief concern about the MSR is that Beijing is building these ports for dual military and commercial purposes. If that is the case, when needed, these commercial ports could serve as military facilities for the Chinese navy to help mitigate Beijing’s geographical disadvantages in the region. China’s strategic interests in the Indian Ocean relate closely to the so-called Malacca Dilemma. China fears that, in the event of a conflict with India or the United States, its foes would attempt to block China’s trade routes through the Malacca Strait, a key chokepoint through which a high percentage of China’s energy imports from the Middle East pass. To secure its energy supply lines, Beijing would have to either find an alternate route for its energy shipments or strengthen its navy’s capacity to protect and keep open existing shipping lanes. The MSR attempts to do both. To further address the Malacca Dilemma, China has revived the idea of constructing the Kra Canal, a proposed waterway that would cut across the Kra Isthmus in Thailand, bypassing the Malacca Strait. While this idea has been around since the nineteenth century, it has not yet been realized due to various political and strategic concerns. If completed, the canal would shorten the travel distance between the Pacific and Indian Oceans.55 It would also bypass the Malacca Strait and open up into the Andaman Sea, where India has its naval base in the Andaman and Nicobar Islands, presumably bringing Chinese maritime traffic closer to India. The construction of the canal requires significant capital and technology, which the MSR could furnish. The MSR gives China an opportunity to address the Malacca Dilemma and strengthen its presence in the Indian Ocean region. Because of this and other projects, the MSR could pose a serious challenge to India’s traditional dominance of the Indian Ocean region. In addition to any unilateral steps it is taking, New Delhi is working more closely with other countries. India is strengthening its security ties with Indian Ocean neighbors—such as the Maldives, Mauritius, the Seychelles, and Sri Lanka—even as it revitalizes a sense of Indian Ocean regionalism and steps up naval engagement with the littoral states of the Bay of Bengal. At the same time, New Delhi is expanding naval engagement and other forms of collaboration with Australia, France, Japan, and the United States to maintain the current security environment and protect its strategic and security interests. India understands the economic and technical limitations that constrain its ability to present a vision for regional connectivity. One key will be taking a collaborative approach with regional partners. New Delhi has already begun to collaborate with Japan on an alternative to China’s infrastructure-funding model. There is convergence between Japan’s Partnership for Quality Infrastructure and India’s Act East policy. Realistically, New Delhi will also have to look beyond Japan and reengage with its smaller maritime neighbors in the Indian Ocean. India must be able to identify development projects with the ASEAN nations and the other littoral countries of the Bay of Bengal and the Indian Ocean. India must explore opportunities for trilateral engagement that would allow it to share its resources while advancing a common vision on regional connectivity. Farther afield, New Delhi and Tokyo also have launched the Asia-Africa Growth Corridor to tap into the potential to link the two continents by way of the Indian Ocean. Japan and India have emerged as natural partners in the region for a number of reasons. Like New Delhi, Tokyo has grave misgivings about China’s growing presence in its neighborhood. Beijing’s assertive behavior in the South China Sea (a key trade route between Japan and the Indian Ocean) is a serious issue for Japan. Beijing and Tokyo also have a territorial dispute in the East China Sea over the Senkaku/Diaoyu Islands. China has also prompted competition in South Asia, where Japan has been a predominant donor of development projects. Tokyo shares New Delhi’s concerns regarding China’s connectivity projects, namely unsustainable debt practices, a disregard for sovereignty and territorial integrity, and a lack of transparency. Japan worries that an influential China will spread its approach to doing business and alter the current security architecture and environment in ways that Japan considers hostile to its strategic interests. New Delhi and Tokyo are also uneasy about China’s disregard for established rules and norms on dispute resolution, as seen in Beijing’s decision to ignore an international tribunal’s July 2016 ruling on China’s territorial claims in the South China Sea. India and Japan’s converging strategic interests give both countries incentives to offer alternatives to Chinese-led connectivity projects. The maritime domain offers some promising opportunities, and India has increased its partnerships and collaboration in the Indian Ocean. The maritime domain offers some promising opportunities, and India has increased its partnerships and collaboration in the Indian Ocean. To cite a few examples, India is partnering with Japan to create smart-islands and maritime corridors, even as New Delhi intensifies collaboration with the United States on antisubmarine warfare. At the same time, India is cooperating more actively with France across the Indian Ocean on initiatives ranging from complex military exercises to information sharing aimed at enhancing maritime domain awareness.57 New Delhi will have to continue working closely with partners such as the United States, France, Japan, and Australia to expand its maritime footprint. Simultaneously, India must explore possible ways to collaborate with other countries like Indonesia, Singapore, and the UK. As it contemplates these steps, India will have to debate and consider new concepts and ideas, such as joint facilities and burden sharing, in response to its changing regional security environment. Connectivity is increasingly seen as a tool for exerting foreign policy influence. This view is reflected at the highest levels of diplomacy by countries like India, Japan, and the United States that have issued strong remarks about connectivity and infrastructure.58 Clearly, politics and connectivity are entwined in complex ways. Connectivity is increasingly seen as a tool for exerting foreign policy influence. Given the geopolitical stakes and India’s reservations about how China’s BRI connectivity projects are currently being pursued and the strategic advantages they may confer, there is likely little scope for the two countries to collaborate on the BRI. India perceives efforts to enhance interconnectedness as a new theater for geopolitical competition with China in South Asia and the Indian Ocean. At the same time, connectivity also presents India with an opportunity to reestablish its regional primacy. On initiatives like the BCIM Economic Corridor that include both China and India, New Delhi probably will continue to drag its feet and slow down discussions. There may be limited opportunities for collaboration through institutions that count both India and China as members, but the increasing mistrust in the relationship will hamper any positive momentum. When it comes to outstanding invitations to participate in other Chinese-led initiatives like the MSR, New Delhi will remain hesitant, knowing that joining such projects is not in its strategic interests. will likely maintain bilateral collaboration with countries like Japan while also remaining engaged with entities like BIMSTEC and the Bay of Bengal community, of which China is not a part. Most of all, India must stop underestimating Chinese goals and ambitions in the region. Ultimately, India must be more proactive. While China is successfully implementing development projects hundreds of miles from its borders, India is still struggling to craft domestic development plans for its own border regions. New Delhi intends to prioritize development in its international engagement, but India will have to weave together its ad-hoc initiatives into one coherent road map to regional connectivity and infrastructure construction. Even as India must address infrastructure and development needs at home, it also needs to provide an alternative to China’s overtures to the region. To this end, India must not only respond to the changes Chinese engagement is prompting in its neighborhood but also collaborate with partners to further its vision of regional connectivity, while accounting for its own capacity and resource limitations. Until the advent of the BRI, New Delhi did not feel its bilateral relationships with its neighbors were threatened as there was no such competition between India and leading donors in South Asia, like Japan. China’s rise not only introduces a new actor in South Asian dynamics but also highlights the underlying fact that Beijing’s influence in the region comes at a cost to India’s role and profile as a regional leader. China’s engagements in South Asia are a result of its global ambitions to be a great power. Like every rising power in history, China questions the existing order and aims to create a structure favorable to its interests. India currently lacks the resources to compete with China in terms of global power ambitions, and this shift undoubtedly affects New Delhi’s strategic and national interests. In some cases, India can take steps on its own to sharpen its response. To begin with, India will have to clearly account for its resources and capabilities related to connectivity and infrastructure development. The current government understands the urgency of acting boldly to address the changes in its neighborhood, efforts that will require fresh thinking and new approaches, such as the concept of burden sharing. New Delhi must invest in and develop its strategic assets—like the Andaman and Nicobar Islands, for instance—to project power across the Indian Ocean. These unilateral steps notwithstanding, India’s ongoing response might not be enough to provide neighbors with a feasible alternative to Beijing’s continental and maritime projects, in light of New Delhi’s significant resource limitations. Given India’s massive mandate to develop much-needed infrastructure domestically, the country’s ability to act alone in South Asia and the larger Indian Ocean is further limited. New Delhi cannot and need not act alone. Fortuitously, convergence between the strategic interests of India and other regional actors (especially Japan) have provided both incentives and opportunities for collaboration. New Delhi must seek help from partners like Japan when necessary to build and upgrade its infrastructure and create an alternative to Chinese-led connectivity corridors and infrastructure projects. New Delhi must seek help from partners like Japan when necessary to build and upgrade its infrastructure and create an alternative to Chinese-led connectivity corridors and infrastructure projects.59 India must have a blueprint to identify specific projects, mechanisms, and goals for its connectivity initiatives. Other countries like Australia, France, Germany, the UK, and the United States are keen to see India play a leading role in the region. These nations have technical expertise and are already present in the region to some degree. New Delhi must identify the advantages each of these states offer and leverage them to collaborate in areas of common interest and pursue its strategic connectivity goals. Together, India and these countries can coordinate their use of resources to address common goals such as peace and security. While India seems to have identified partnerships as a way to address its connectivity challenges, it must now be deliberate about the nature and scope of relevant projects in the region. So far, New Delhi’s response has been reactive and inadequate. If India continues to pursue a reactive policy, it will exhaust its limited resources chasing China as Beijing strives to become a regional and global power. India must take stock of its strategic priorities; create a sensible, coherent policy framework in response; and move toward a burden-sharing model with its partners to secure its strategic interests in the region. As the BRI and other connectivity projects transcend and reimagine boundaries and connect Asia with far-flung locations around the world, policymakers have to grapple with new ideas and challenges. Competition and other diplomatic interactions between China and India bilaterally, in their neighborhood, and on a global scale will shape Asia’s new security architecture and determine the region’s economic and strategic terrain for many years to come. Darshana M. Baruah is associate director and senior research analyst at Carnegie India. Her primary research focuses on maritime security in Asia, particularly the Indian Navy and its role in a new security architecture. Her work also examines the strategic implications of China’s infrastructure and connectivity projects in the Indian Ocean region and South Asia. Baruah was a 2016 national parliamentary fellow in Australia, where her research focused on India and Australia in the Indo-Pacific. In the Australian parliament, she was associated with the office of Teresa Gambaro, the chair of the Joint Standing Committee on Foreign Affairs, Defense, and Trade. There, Baruah worked on issues such as the South China Sea, opportunities and challenges in the India-Australia maritime relationship, and India’s role in the Indo-Pacific. She was also a visiting fellow at the Australian National University, the academic partner of the parliamentary fellowship. While in Australia, she also briefly served as a visiting fellow in the International Security Program at the Lowy Institute. 1 “Asia Infrastructure Needs Exceed $1.7 Trillion Per Year, Double Previous Estimates,” Asian Development Bank, February 28, 2017, https://www.adb.org/news/asia-infrastructure-needs-exceed-17-trillion-year-double-previous-estimates. 2 Organization for Economic Co-operation and Development (OECD), “Development Aid at a Glance,” May 22, 2017, http://www.oecd.org/dac/financing-sustainable-development/development-finance-data/Asia-Development-Aid-at-a-Glance.pdf. 3 Indian Ministry of External Affairs, “Speech by Foreign Secretary at Raisina Dialogue,” March 2, 2016, http://mea.gov.in/Speeches-Statements.htm?dtl/26433/Speech_by_Foreign_Secretary_at_Raisina_Dialogue_in_New_Delhi_March_2_2015. 5 Kai Schultz, “Sri Lanka, Struggling With Debt, Hands a Major Port to China,” New York Times, December 12, 2017, https://www.nytimes.com/2017/12/12/world/asia/sri-lanka-china-port.html. 6 Xinhua News Agency, “New Five-Year Plan Brings Hope to China’s West,” December 27, 2016, http://english.gov.cn/premier/news/2016/12/27/content_281475526349906.htm. 7 Christophe Jaffrelot, “Corridor of Economic Uncertainty,” Indian Express, June 13, 2017, http://indianexpress.com/article/opinion/columns/corridor-of-economic-uncertainty-barf-obor-india-china-pakistan-military-4700921/. 8 Li Keqiang, “Report on the Work of the Government,” (delivered at the Third Session of the Twelfth National People’s Congress), State Council, March 5, 2015. 9 “Joint Communique of the Leaders Roundtable of the Belt and Road Forum for International Cooperation,” Chinese Ministry of Foreign Affairs, May 16, 2017, http://www.fmprc.gov.cn/mfa_eng/zxxx_662805/t1462012.shtml. 10 “Vision and Actions on Jointly Building Silk Road Economic Belt and 21st-Century Maritime Silk Road,” National Development and Reform Commission, People’s Republic of China, press release, March 28, 2015, http://en.ndrc.gov.cn/newsrelease/201503/t20150330_669367.html. 11 Tom Hancock, “China Encircles the World With One Belt, One Road Strategy,” Financial Times, May 4, 2017, https://www.ft.com/content/0714074a-0334-11e7-aa5b-6bb07f5c8e12. 12 Ankit Panda, “Comment: Time for China to Come Clean on its Goals for Belt and Road Initiative,” South China Morning Post, May 11, 2017, http://www.scmp.com/news/china/diplomacy-defence/article/2093960/comment-time-china-come-clean-its-goals-belt-and-road. 13 “Building the Maritime Silk Road of the 21st Century With Open Mind and Bold Courage,” (Address by Mr. Li Zhaoxing, Former Foreign Minister and Chairman of China Public Diplomacy Association at the International Symposium on Maritime Silk Road of the 21st Century), Chinese Ministry of Foreign Affairs, February, 12, 2015, http://www.fmprc.gov.cn/mfa_eng/wjdt_665385/zyjh_665391/t1237173.shtml. 14 Steve Holland and James Pomfret, “Obama Cancels Asia Tour Over Shutdown; Raises Questions on U.S. Pivot,” Reuters, October 4, 2013, http://www.reuters.com/article/us-usa-fiscal-obama-cancel/obama-cancels-asia-tour-over-shutdown-raises-questions-on-u-s-pivot-idUSBRE99302J20131004. 15 “New Asian Security Concept For New Progress in Security Cooperation,” (remarks at the Fourth Summit of the Conference on Interaction and Confidence Building Measures in Asia), Shanghai Expo Center, May 21, 2014, http://www.fmprc.gov.cn/mfa_eng/zxxx_662805/t1159951.shtml. 17 “‘Yidai yilu’ guoji hezuo gaofeng luntan chengguo qingdan” [Report on the results of the international cooperation summit forum], the Belt and Road Forum for International Cooperation, May 16, 2017, http://www.beltandroadforum.org/n100/2017/0516/c24-422.html. 18 Shannon Tiezzi, “Who is Actually Attending China’s Belt and Road Forum?” Diplomat, May 12, 2017, http://thediplomat.com/2017/05/who-is-actually-attending-chinas-belt-and-road-forum/. 19 “Xi Jinping ‘Yidai yilu’ guoji hezuo gaofeng luntan kaimushishang de yanjiang” [Xi Jinping’s speech at the opening ceremony of the international cooperation summit forum], Beijing, May 14, 2017, http://www.beltandroadforum.org/n100/2017/0514/c24-407.html. 20 “Our Bulldozers, Our Rules,” Economist, July 2, 2016, https://www.economist.com/news/china/21701505-chinas-foreign-policy-could-reshape-good-part-world-economy-our-bulldozers-our-rules; and Jonathan E. Hillman, “China’s Belt and Road Initiative: Five Years Later”, Center for Strategic and International Studies, January 25. 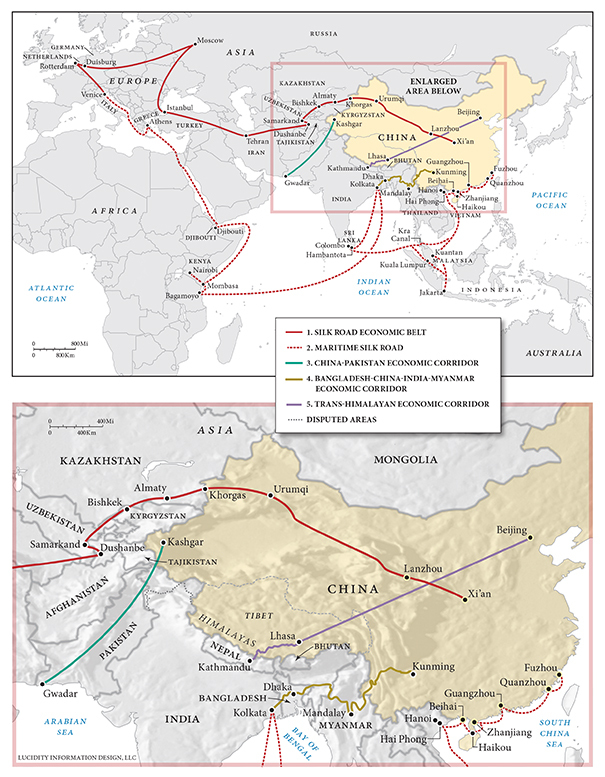 2018, https://www.csis.org/analysis/chinas-belt-and-road-initiative-five-years-later-0. 21 “‘Yidai yilu’ guoji hezuo gaofeng luntan chengguo qingdan” [Report on the results of the international cooperation summit forum], the Belt and Road Forum for International Cooperation. 22 “Joint Communique of the Leaders Roundtable of the Belt and Road Forum for International Cooperation,” Chinese Ministry of Foreign Affairs. 23 Li Jing (editor), “China Issues First Big Data Report on Belt and Road Initiative,” Belt and Road Portal, November 11, 2016, https://eng.yidaiyilu.gov.cn/qwyw/rdxw/2248.htm. 24 Shyam Saran, “The Beijing Balancing Act,” Hindu, August 17, 2016, http://www.thehindu.com/opinion/op-ed/The-Beijing-balancing-act/article14572916.ece. 25 “Official Spokesperson’s Response to a Query on Participation of India in OBOR/BRI Forum,” Indian Ministry of External Affairs, May 13, 2017, http://mea.gov.in/media-briefings.htm?dtl/28463/Official+Spokespersons+response+to+a+query+on+participation+of+India+in+OBORBRI+Forum. 27 John Hurley, Scott Morris, and Gailyn Portelance, “Examining the Debt Implications of the Belt and Road Initiative from a Policy Perspective,” Center for Global Development, March 04, 2018, https://www.cgdev.org/publication/examining-debt-implications-belt-and-road-initiative-a-policy-perspective; and Maria Abi-Habib, “How China Got Sri Lanka to Cough Up a Port,” New York Times, June 25, 2018, https://www.nytimes.com/2018/06/25/world/asia/china-sri-lanka-port.html. 28 “Joint Statement - United States and India: Prosperity Through Partnership”, Indian Ministry of External Affairs, June 27, 2017, http://www.mea.gov.in/bilateral-documents.htm?dtl/28560/Joint+Statement++United+States+and+India+Prosperity+Through+Partnership. 29 Srikanth Kondapalli, “Why India Is Not Part of the Belt and Road Initiative Summit,” Indian Express, May 15, 2017, http://indianexpress.com/article/opinion/why-india-is-not-part-of-the-belt-and-road-initiative-summit-4656150/. 31 Khurram Husain, “Exclusive: CPEC Master Plan Revealed,” Dawn, June 21, 2017, https://www.dawn.com/news/1333101. 32 Sajid Hussain, “China’s CPEC Investment in Pakistan Reaches $62 billion,” Live Mint, April 12, 2017, http://www.livemint.com/Politics/dB5tQKISoKNrvl7EwDPFbP/Chinas-CPEC-investment-in-Pakistan-reaches-62-billion.html. 33 “India Asks China to Cease Activities in Pakistan occupied Kashmir,” Indian Express, September 3, 2012, http://archive.indianexpress.com/news/india-asks-china-to-cease-activities-in-pakistan-occupied-kashmir/997108/. 34 “Statement by First Secretary, Permanent Mission of India to the United Nations Exercising India’s Right of Reply During the General Debate of Seventieth Session of UN General Assembly,” Indian Ministry of External Affairs, September 30, 2015, http://mea.gov.in/Speeches-Statements.htm?dtl/25872/Statement_by_First_Secretary_Permanent_Mission_of_India_to_the_United_Nations_exercising_Indias_Right_of_Reply_during_the_General_Debate_of_70th_sessi. 36 “Recent Developments in Doklam Area,” Indian Ministry of External Affairs, June 30, 2017, http://www.mea.gov.in/press-releases.htm?dtl/28572/Recent_Developments_in_Doklam_Area; and C. Raja Mohan, “Raja Mandala: India and China — Rebuild the Trust,” Indian Express, December 19, 2017, https://indianexpress.com/article/opinion/columns/india-and-china-rebuild-the-trust-doklam-standoff-4988820/. 37 “Chinese Army Troops Spotted Along Line of Control in Pakistan-occupied Kashmir,” Economic Times, March 13, 2016, https://economictimes.indiatimes.com/news/defence/chinese-army-troops-spotted-along-line-of-control-in-pakistan-occupied-kashmir/articleshow/51380320.cms. 38 Shivshankar Menon, “As China’s Pakistan Ties Deepen, India Needs a Strategy to Mitigate the Fallout,” Wire, July 11, 2016, https://thewire.in/50524/chinas-pakistan-ties-deepen-india-needs-strategy-mitigate-fallout/. 39 Dean Nelson, “China Plans to Rebuild Burma’s World War Two Stilwell Road,” Telegraph, January 6, 2011, http://www.telegraph.co.uk/news/worldnews/asia/china/8243834/China-plans-to-rebuild-Burmas-World-War-Two-Stilwell-Road.html. 40 “Joint Statement on the State Visit of Chinese Premier Li Keqiang to India,” Indian Ministry of External Affairs, May 20, 2013, http://www.mea.gov.in/bilateral-documents.htm?dtl/21723. 41 “Joint Statement Between India and China During the Prime Minister’s Visit to China,” Indian Prime Minister’s Office, May 15, 2015, http://pib.nic.in/newsite/PrintRelease.aspx?relid=121755. 42 Dinesh Kotwal, “The Naga Insurgency: The Past and The Future,” Institute for Defense Studies and Analyses, http://www.idsa-india.org/an-jul-700.html. 43 Ajit Doval, “26/11 Versus Samjhauta: One Does Not Justify Other,” Ajit Doval’s Perspectives (blog), September 22, 2011, http://ajitdoval.blogspot.in/2011/09/. 44 Madhukar SJB Rana, “Trans-Himalayan Economic Corridor: Nepal as a Gateway,” Observer Research Foundation, February 10, 2017, https://www.orfonline.org/research/trans-himalayan-economic-corridor-nepal-as-a-gateway/#_ftn8. 45 Darshana M. Baruah, “Nepal Joined the Belt and Road. What Does That Mean for India?” Diplomat, May 15, 2017, http://thediplomat.com/2017/05/nepal-joined-the-belt-and-road-what-does-that-mean-for-india/. 46 “Investment Required in Infrastructure,” Himalayan Times, November 10, 2016, https://thehimalayantimes.com/business/investment-required-infrastructure/. 48 Ananth Krishnan and Nivedita Dash, “China Opens New Trade Route to Nepal Amid India Tensions,” India Today, May 12, 2016, http://indiatoday.intoday.in/story/china-opens-new-trade-route-to-nepal-amid-india-tensions/1/666482.html. 49 Pradumna B. Rana and Binod Karmacharya, “A Connectivity-Driven Development Strategy for Nepal: From a Landlocked to a Land-Linked State,” Asian Development Bank Institute Working Paper no.498, September 2014, https://www.adb.org/sites/default/files/publication/156353/adbi-wp498.pdf. 50 “Report on the List of Strategic Rail Projects,” Indian Ministry of Defense, March 11, 2013, http://pib.nic.in/newsite/PrintRelease.aspx?relid=93370. 51 Anurag Kotoky and N. C. Bipindra, “After Decades of Neglect, India Builds Roads Along China Border,” Economic Times, July 12, 2018, https://economictimes.indiatimes.com/news/defence/after-decades-of-neglect-india-builds-roads-along-china-border/articleshow/58833597.cms. 52 Charlotte Gao, “China Officially Sets Up Its First Overseas Base in Djibouti,” Diplomat, July 12, 2017, http://thediplomat.com/2017/07/china-officially-sets-up-its-first-overseas-base-in-djibouti/. 53 Kiran Stacey, “China Signs 99-Year Lease on Sri Lanka’s Hambantota Port,” Financial Times, December 11, 2017, https://www.ft.com/content/e150ef0c-de37-11e7-a8a4-0a1e63a52f9c. 55 David Brewster, “The Kra Canal: Double Bypass,” Lowy Institute Interpreter (blog), August 14, 2017, https://www.lowyinstitute.org/the-interpreter/kra-canal-double-bypass. 57 “Joint Strategic Vision of India-France Cooperation in the Indian Ocean Region,” Indian Ministry of External Affairs, March 10, 2018, http://www.mea.gov.in/bilateral-documents.htm?dtl/29598/Joint+Strategic+Vision+of+IndiaFrance+Cooperation+in+the+Indian+Ocean+Region+New+Delhi+10+March+2018. 58 “Growth, Connectivity Key to India’s Foreign Policy Thinking: S. Jaishankar,” Economic Times, August 25, 2017, https://economictimes.indiatimes.com/news/economy/policy/growth-connectivity-key-to-indias-foreign-policy-thinking-s-jaishankar/articleshow/60224892.cms. 59 Darshana M. Baruah, “Toward Strategic Economic Cooperation Between India and Japan” Carnegie India, December 2016, http://carnegieindia.org/2016/12/01/toward-strategic-economic-cooperation-between-india-and-japan-pub-66326.